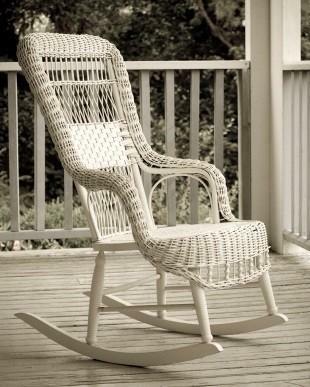 Antique rattan furniture is as much at home on the porch or sunroom as in the bedroom. It works with many different decorating styles and is a favorite of decorators everywhere. Rattan, bamboo, wicker; what is the difference? These are all materials that have been used to make furniture that was especially popular during the Victorian era. Rattan and bamboo are plants, but wicker describes a certain way of weaving fibers. Wicker can be woven of bamboo, rattan, or even straw but only rattan can be rattan. It is the stem of a tropical tree that is related to the palm. It grows upward and then bends over and continues growing more like a vine than a tree. Unlike bamboo, the trunk or stem of rattan is solid which makes it a better candidate for making sturdy furniture. When the rattan has matured it is cut into sections that measure twelve feet or more. The sections are dried and then processed in the processing plants, usually in Southeast Asia or the Philippines. To make furniture the rattan is stripped of leaves and outer fibers. Small pieces are soaked and bent into shape while larger pieces are steamed to make them flexible. The large stems look like bamboo which can confuse the novice collector. Antique rattan furniture usually has the joints wrapped with fiber for stability. More modern furniture will have the joints wrapped with leather or plastic to hide any screws. Rattan furniture was being made over 5,000 years ago in Egypt and was discovered in many ancient excavation sites. In America manufacturers began producing rattan furniture during the mid 1800s. Victorian society had a hatred of germs and rattan was seen at being a clean alternative to upholstered furniture. The flexibility of the material allowed artisans to manipulate it into the complex patterns that the Victorians favored. As the decades passed the versatile material was formed in the sleek lines of Art Deco and Modernist styles. Rattan is difficult to identify because most of it is not labeled by the manufacturer. Some designers are easy to pick out because of their unique design style. Below are two that are well known for their rattan designs, especially chairs. Paul Frankl was a furniture designer, probably the first to utilize rattan in a modern way in America during the 1930s through 1950s. His designs were sought after by the glamorous Hollywood crowd for their clean, Art Deco lines. You can see a beautiful example of Frankl's design in his 1930s vintage rattan couch. Baughman designed rattan furniture in the 1940s and 50s for a company called Calif-Asia. Many beautiful rattan and wrought iron chairs are attributed to him. With regular cleaning and maintenance your vintage rattan furniture can last for a very long time. Use Murphy's oil soap and some water whisked up into thick suds. Skim off the bubbles (not the water) and rub them into the rattan with a clean cloth. Use a toothbrush to get stubborn dirt out of crevices. Wipe with a dry cloth and allow to air dry completely. Repeat this cleaning about once a month for best results. Dust it once a week with a feather duster. After cleaning, rub lemon oil into the rattan. Keeping your antique rattan furniture oiled will help keep it from splitting. If your furniture does split, apply furniture glue and use tape or a wrap to hold the pieces in place until the glue completely dries. Online venues like eBay and craigslist. If you find something you like that is in good shape, be prepared to pay for it. Good Victorian rattan furniture is worth a large amount of money.